Medical imaging from computed tomography (CT) examinations makes the largest contribution to the radiation dose received by patients from medical exposures., Therefore, it is important to determine patient dosimetry on CT scanners. The standard quantity used for CT dosimetry measurement is the CT dose index (CTDI). CTDI is the single slice dose profile integrated over a distance normally defined as ±50 mm from the middle of the beam. This is usually carried out with a 100 mm long ion chamber and the result divided by the nominal beam width; this is called CTDI100. The CTDI100 can be measured in air or inside phantoms simulating parts of the body. The weighted CTDI, which is a parameter linked to patient dose, is calculated from CTDI100 measured at central and peripheral positions within the phantom and a related quantity, namely the volume averaged CTDI is displayed for each examination performed on CT scanners. Tissue equivalent materials are used to make phantoms, in order to evaluate the doses received by patients. These are made from polymethyl methacrylate (PMMA) or Perspex. PMMA is homogenous, has a reproducible composition, and easy to machine, but phantoms made of PMMA are expensive, costing about £1000 in Thailand, and are too expensive for wide-scale hospital use. The International Commission on Radiation Units and Measurements report number 44 gives the physical quantities that should be considered when tissue equivalent materials are selected for dosimetric studies in radiation diagnosis and therapy. However, from a review of the literature, there are few tissue equivalent materials which have been developed for routine dosimetric quality control for diagnostic radiology. Nylon is one of the most widely used plastics. It offers a combination of mechanical performance and cost. It has a low atomic number, its density is similar to that of human tissue, and the mass attenuation coefficient is similar to that of human brain tissue., Philips (Philips Healthcare) has adopted a nylon phantom for daily image quality and CT number test. There are many nylon grades with similar properties. However, the most common types are nylon 6/6 and cast nylon 6. Cast nylon 6, (C6H11 NO)n, has some distinct advantages. It is less expensive and easy for workshops in Thailand to obtain. Therefore, it provides a possible alternative material for constructing CT dosimetry phantoms. The aim of this study was to compare CTDI values measured in the PMMA and nylon dosimetry phantoms in order to assess whether nylon phantoms might provide an alternative option that could be used in Thai hospitals to facilitate dosimetry measurements. 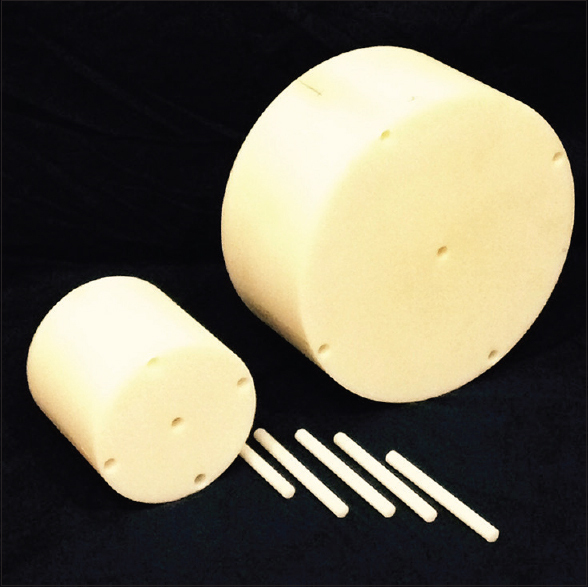 Standard CT dosimetry phantoms, as defined in the International Electrotechnical Commission standard, used in this study are CT dose phantom kit for adult head and body Model 76-419-4150 (Fluke Electronics Corporation, Everett, WA, USA). The phantoms are cylinders 160 mm and 320 mm in diameter to represent the human head and body, respectively. Each phantom is 150 mm long, has five cylindrical holes along the z-axis, one at the center and four at the periphery (10 mm from each edge of the phantom). The newly developed phantoms are similar in shape and size but made of nylon [Figure 1] and with inserts made of the same material. Each part contains five probe holes, one in the center and four at the periphery (10 mm from the edge). The inside diameter of the holes is 13 mm. Properties of phantom materials are shown in [Table 1]. The effective atomic numbers for PMMA and nylon are 6.48 and 6.85 while physical densities are 1.17 g/cm 3 and 1.14 g/cm 3, respectively. Comparisons of CT number and CTDI between phantoms of different materials were carried out using a Toshiba Aquilion 64 model (64 slices) CT scanner. Tube warm-up and daily calibration (air scans), as recommended by the manufacturer, were performed. The phantoms were laid on the couch at the isocenter of the scanner using the CT scanner's alignment lights. where µmaterial and µwater are linear attenuation coefficients of the material and water at the same energy, respectively. The unit for CT number is Hounsfield units (HU). For measurement of CT number and the uniformity of the CT numbers, the phantoms were scanned in axial mode. The scan parameters are shown in [Table 2]. CT numbers of the nylon and PMMA at the kVp settings of 80, 100, 120, and 135 kVp were measured. For each kVp setting, circular region of interest (ROI) tool at the scanner console was used to define an ROI of approximately 500 mm 2. Values of CT number were measured using a window width of 100 and window level of 0. ROIs were placed around the center of the image and the four edge positions close to the inserts along the phantom length in the z-direction. The absolute value of the CT number at each kVp setting for each phantom material was analyzed. The uniformity of the CT number was assessed for each slice by using the differences in the CT number at the center and the mean CT number at each of four edge positions of the phantom. The European guidelines on quality criteria state that CT number accuracy from baseline measurements for a given material should be within ±5 HU tolerance. For comparisons of the CTDI (in a unit of mGy/200 mAs) between both head and body phantoms of the two phantom materials, all measurements were made with axial scanning (pitch = 1), at 80 kVp, 100 kVp, 120 kVp, and 135 kVp. These were measured for four different beam widths and kVp settings. The other scan parameters were 200 mA and a 1 s rotation time for each kVp setting. The axial slice widths (number x width, mm) were 4 mm (4 × 1), 8 mm (4 × 2), 16 mm (4 × 4), and 32 mm (4 × 8). Assessments of the CTDI100 were made at the center (c) and periphery (p) of both phantoms. A 100 mm ionization chamber of type Radcal 10 × 5–3 CT (Radcal Corporation, Monrovia, CA, USA) and serial number 8609 (active length of 10 cm and active volume of 3 cm 3) with an electrometer of type Radcal 9,010 and serial number 90–2000 was used to measure CT dose in the newly developed nylon [Figure 2] and the PMMA reference phantoms. The CTDI100 values at the periphery were the average from the four edge positions of the phantom. Where nT is the total beam collimation and D (z) dz is the dose along z-axis. Where CTDIc is CTDI measured in the center of the phantom and CTDIp is the average value of four peripheral CTDIs. Values of the uniformity in CT number measured at the center and any position in the periphery of the head phantom were within ±5 HU for the PMMA and nylon phantoms for all kVp settings. However, those for the body phantom differed by up to ±13 HU for both PMMA and nylon. 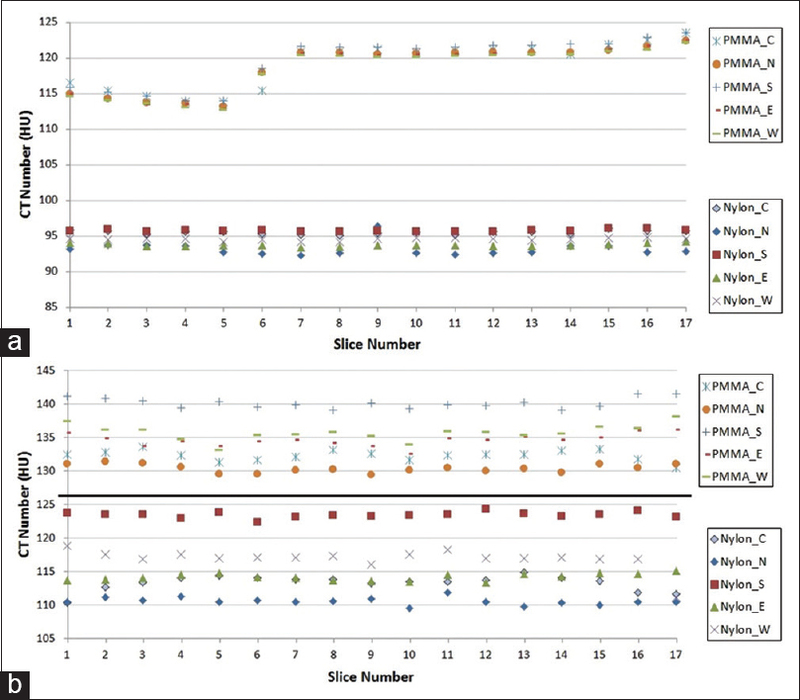 The range of differences in CT numbers between the center and each position of periphery for each of seventeen slices, along the z-axis of the nylon and PMMA head and body phantoms, for four kVp settings are shown in [Table 3]. The values of the CT number measured at 120 kVp at five positions of individual slices are shown in [Figure 3]. The absolute values of the CT number vary with kVp setting as the attenuation changes. The CT number increased with kVp for both materials. For the body phantoms, the CT numbers for 80 kVp, 100 kVp, 120 kVp, and 135 kVp were 110 HU, 123 HU, 133 HU, and 135 HU for PMMA, and 86 HU, 102 HU, 114 HU, and 117 HU for nylon. For the head phantoms, the CT numbers were 15 HU-20 HU lower than those for the body phantom. 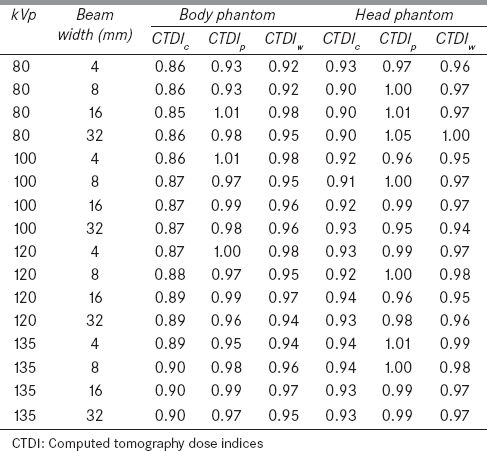 [Figure 4] shows the absolute values of CT number for each kVp setting in head and body phantoms of both materials. The measured CTDI values at the center and periphery and the weighted CTDI for both phantoms are shown in [Figure 5] and [Figure 6]. When using 4 mm wide beams, the CTDIw for the nylon head phantom at 80 kVp was 32 mGy/200 mAs, and this rose to 105 mGy/200 mAs for 135 kVp. For the nylon body phantom, the CTDIw values at 80 kVp and 135 kVp, were 7 mGy/200 mAs and 27 mGy/200 mAs, respectively. 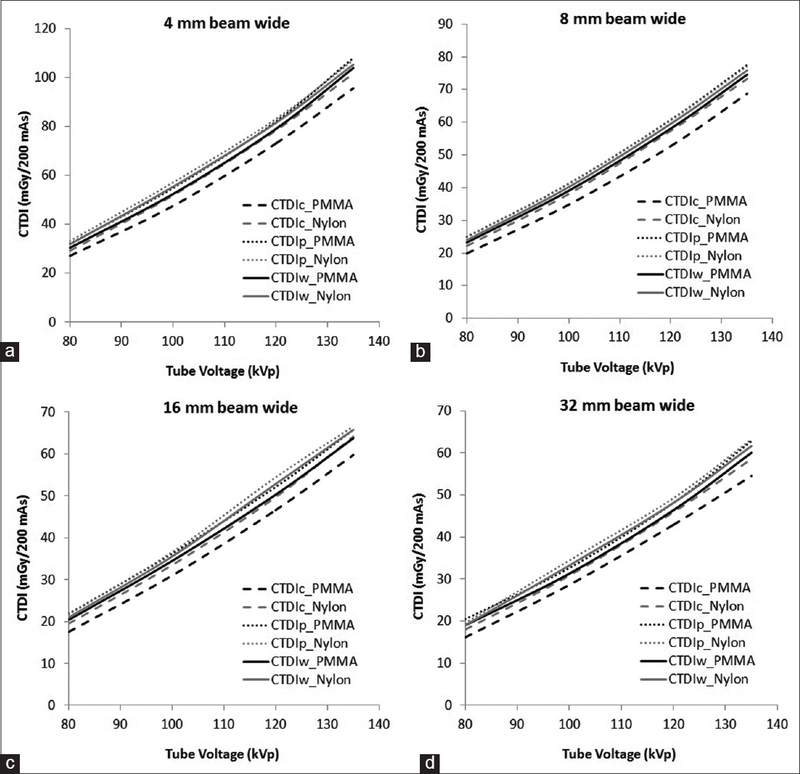 With the same beam width, the CTDIw increased with increasing kVp, from 80 to 100 kVp, 100–120 kVp, and 120–135 kVp, by 1.73, 1.51, and 1.29 times, respectively. 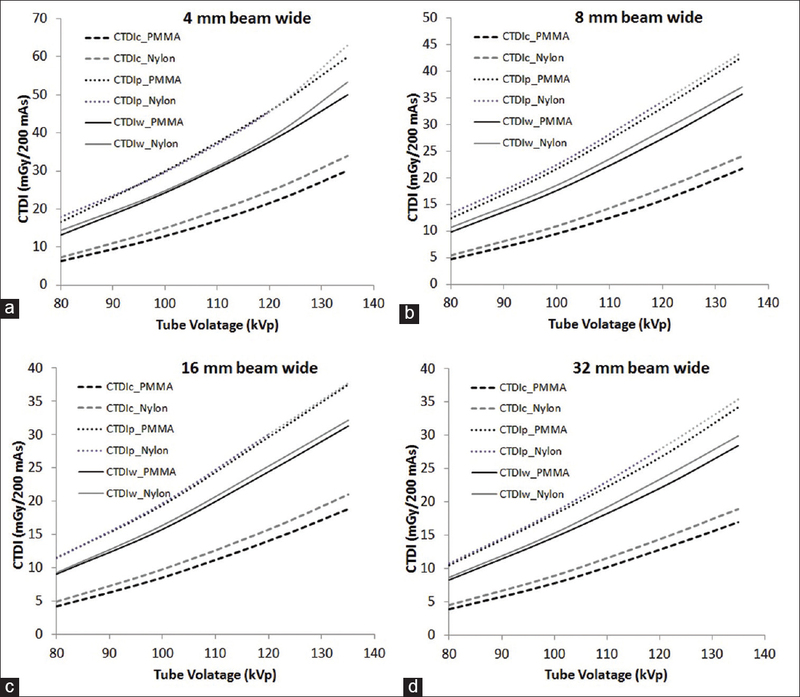 With the same kVp setting, the CTDIw relative to the 4 mm wide beam decreased with increasing beam width by 0.73, 0.66, and 0.61 for 8, 16, and 32 mm wide beams, respectively. 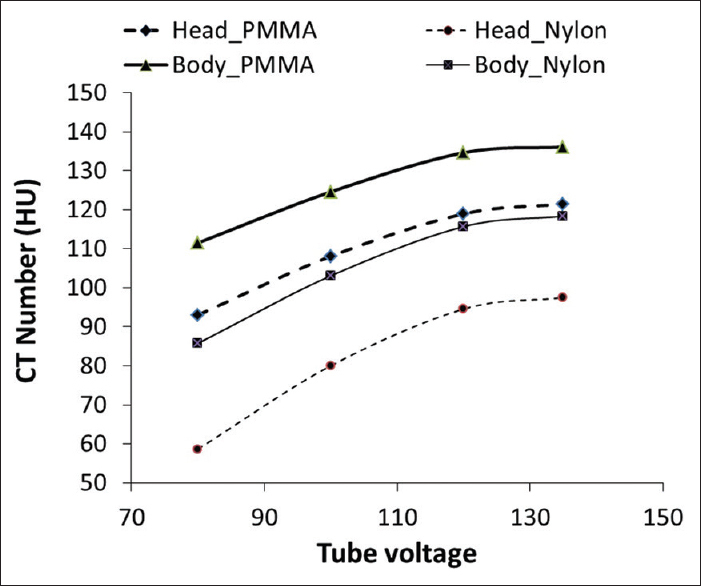 All doses measured in the nylon phantoms were significantly higher than those in the PMMA at all tube voltages investigated. Dose measurements were higher at the centers of the phantoms by up to 12% and 17% for the head and the body phantoms, respectively. Results from all beam width settings varied in a similar way. Ratios of the measured CTDI values in PMMA and nylon for body and head phantoms are shown in [Table 4]. Differences in CTDI measured at the center of the phantoms (CTDIC) were greater than those at the periphery (CTDIp) for both head and body phantoms. Differences in CTDIw values measured in the PMMA, and nylon phantoms were within 8% at all kVp settings, for both head and body phantoms. In order to provide adjustment factors that could be used to estimate CTDI values in PMMA phantoms from results obtained with nylon ones, average ratios are given in [Table 5] for each kVp setting. CT dosimetry phantoms are important tools for quality assurance and accurate characterization of patient dose. The selection of the appropriate material is important. The phantom of choice should have similar properties to water. The standardized phantom material used for CTDI measurement has been PMMA since it is readily available. However, PMMA is not actually a tissue equivalent material. Nylon has similar properties to the human brain , and is recommended as a substitute material for CTDI measurement if PMMA is not available. In this study, nylon was selected since its physical density and mass attenuation coefficient are comparable with those of water and close to those of PMMA. Moreover, the phantom could be made available at a reasonable price. Measurements of CT number through the nylon phantoms confirmed that the phantoms were homogeneous. Measurements made of the CT number along the length of the PMMA head phantom showed a discontinuity in this phantom [Figure 3]a. However, the reason why there is a step change in CT number of the PMMA head phantom may be because the measured ROI of the first six slices included the air space close to the insert rods, so the mean CT number became lower. A disadvantage of nylon is that it is not transparent, so the beams from the alignment lights are not transmitted through the phantoms. However, positioning is carried out primarily by viewing the light beams on the phantom surface, so this is not a significant disadvantage. The CT numbers measured are dependent on photon energy; they increased with kVp for both phantom materials [Figure 4]. This is because of the increasing dominance of photoelectric interactions at lower tube potentials. This causes a given material's attenuation coefficient to vary in a different manner from that of water leading to a dependence of the material's CT number on kVp. For a uniform phantom, the CT number measurement should be uniform throughout. Since this is a relative measurement comparing phantoms of two materials, the technical factors used to measure CT number for both phantom tests were standardized. For the individual kVp settings in the head phantoms, the maximum standard deviation between the central ROI and any peripheral ROI was less than ±5 HU, within the recommendation limit  [Figure 3]a. In contrast to the head phantoms, the maximum standard deviation between the central ROI and any peripheral ROI in the body phantoms of both materials rose up to ± 13 HU [Figure 3]b because of the higher noise level in the larger body phantoms which contributed to the measured CT number. The uniformity of CT number across the phantoms was better at higher tube potentials [Table 3] since the higher energy photon beams had more penetration and so a more uniform dose distribution within the phantoms. For the head phantoms, CTDIs measured at the periphery were similar to those at the center, which were only 1.1 times and 1.1–1.3 times higher than those at the center, for both nylon and PMMA phantoms, respectively [Figure 5]. For the body phantoms, the peripheral values were 1.8–2.5 times and 2.0–2.8 times higher, for nylon and PMMA, respectively [Figure 6]. Comparisons between phantom materials found that the values of CTDIw measured in the nylon phantoms were 1%-8% higher than those in the PMMA ones [Table 4]. This is because nylon has higher attenuation coefficient. The CTDI measured at the periphery of the head and body phantoms were up to 6% and 8% higher in the nylon, while those measured at the center were 12% and 17% higher. Since the values displayed on CT scanner consoles, with which results will need to be compared, are for PMMA phantoms, results are given in terms of the ratio between CTDI values for PMMA and nylon, so multiplication of results derived using a nylon phantom by the values in [Table 5] can be used to estimate CTDIw in PMMA phantom. The dose in PMMA may underestimate that in water or tissue. This conclusion is similar to that in a study by Li et al. who measured the CT dose in PMMA and water cylinders with diameters from 6 to 55 cm using Monte Carlo assessment and found that the dose to water was higher than that to PMMA, especially at the centers of large phantoms. Therefore, CTDI measured in the nylon may be more relevant to that in human tissue. The comparison of CTDIs and CT numbers measured in PMMA and nylon dosimetry phantoms demonstrated that the CT number was uniform across the measurement field in the nylon phantom. The values of CT number for nylon were about 20 HU lower than those for PMMA. For the dose measurement, the measured CTDIw values in the nylon phantoms were about 1–6% higher than those in the PMMA, and adjustment factors have been derived from allowing values in PMMA phantoms to be estimated for results for nylon phantoms. Since the cost of a nylon phantom is about one-fifth of a commercial CTDI phantom, the use of nylon for constructing human phantoms can be an alternative choice for CTDI measurement and may allow CT phantoms to be more widely available for dosimetry measurements in Thai hospitals. Financial support from Naresuan University is gratefully acknowledged. We are thankful the Radiological Department of Buddhachinnaraj Phitsanulok Hospital, Thailand, which provided necessary facilities for carrying out this project. We would also like to thank Mr. Kriengkrai Chanruksa for his assistance in operating the CT scanner. Financial support from Naresuan University. Hart D, Wall BF, Hillier MC, Shrimpton PC. Frequency and collective dose for medical and dental X-Ray examinations in the UK 2008. Oxfordshire: Health Protection Agency; 2010. Jones AK, Hintenlang DE, Bolch WE. Tissue-equivalent materials for construction of tomographic dosimetry phantoms in pediatric radiology. Med Phys 2003;30:2072-81.
International Electrotechnical Commission. Medical Electrical Equipment Part 2-44. Particular requirements for the safety of X-ray equipment for computed tomography. IEC Standard 6061-2-44 Ed. 2 Amendment 1. 4. Geneva: International Electrotechnical Commission; 2003.
International Commission on Radiation Units and Measurements (ICRU). 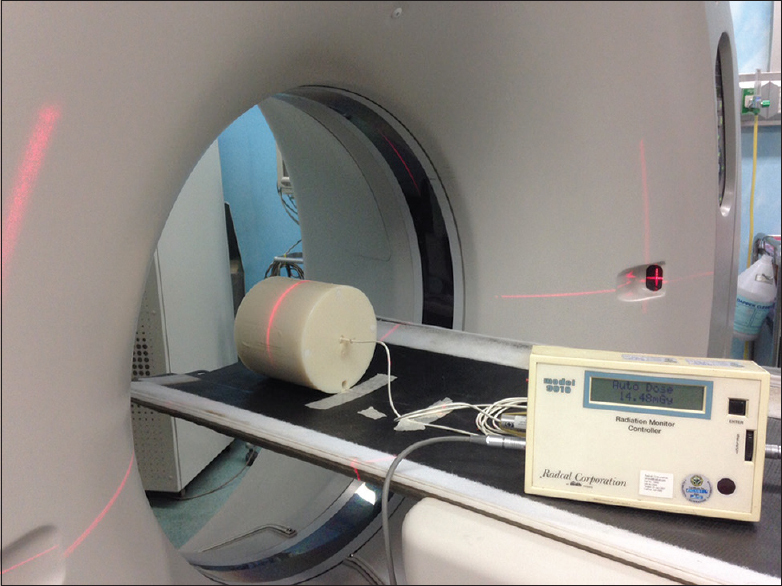 Tissue Substitutes in Radiation Dosimetry and Measurements, ICRU Report 44. Bethesda, Maryland: ICRU Publications; 1989.
International Commission on Radiological Protection. Basic Anatomical and Physiological Data for Use in Radiological Protection Reference Values. Oxford: ICRP Publication 89, Pergamon Press; 2002. Zhang J, Roa D, Sehga V, He Q, Al-Ghazi M. Comprehensive clinical implementation of a 16-slice Brilliance Big Bore CT Simulator in a radiation oncology department. MedicaMundi; 2011. Available from: http://www.medical.philips.com/co_es/about/news/publications/medicamundi/zhang-roa-sehgal-he-al-ghazi-martin.wpd. [Last accessed 2015 Aug 15]. Hubbell JH, Seltzer SM. Tables of X-ray Mass Attenuation Coefficients and Mass-Energy Absorption Coefficients from 1 KeV to 20 MeV for elements Z=1 to 92 and 48 Additional Substances of Dosimetric Interest, NISTIR, Report 5632; 1995. Edyvean S. Effect of ROI Size on Image Noise. Available from: http://www.ctug.org.uk/meet04-01-13/roi_size_image_noise.pdf. [Last accessed 2015 Aug 15]. European Commission. European Guidelines on Quality Criteria for Computed Tomography. Report EUR 16262. Brussels, Belgium: EU; 1999. Seet KY, Barghi A, Yartsev S, Van Dyk J. The effects of field-of-view and patient size on CT numbers from cone-beam computed tomography. Phys Med Biol 2009;54:6251-62. Beland MD, Scappaticci AA, Machan JT, Huda W, Collins SA, Mayo-Smith WW. Effect of patient size on mean sterile water attenuation during multiphase CT examinations. AJR Am J Roentgenol 2013;200:1048-53. Li X, Zhang D, Liu B. Monte Carlo assessment of CT dose equilibration in PMMA and water cylinders with diameters from 6 to 55 cm. Med Phys 2013;40:031903.